Sorry to SPAM you guys, but I figured the type of riders on this forum would appreciate this post. Blurry, might I suggest that you give us a little more detail about your seatpost? 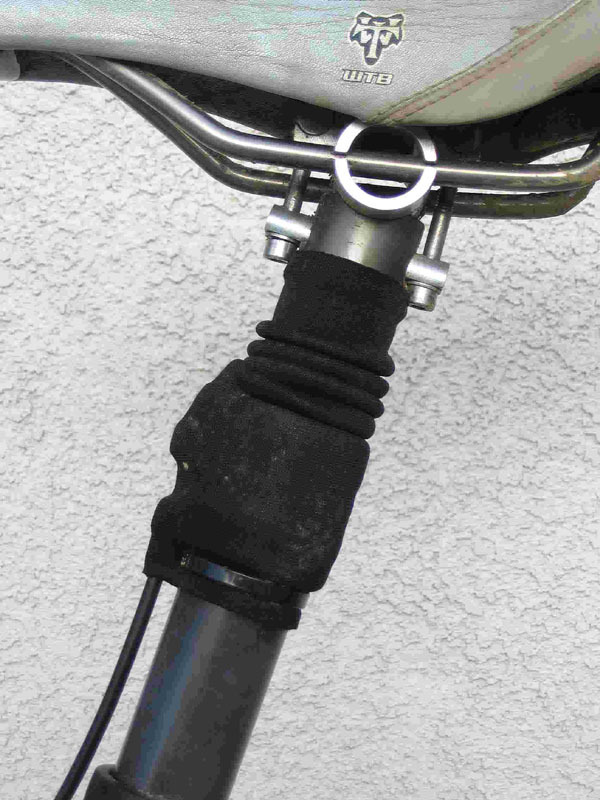 Many of us here use gravity droppers; how is your seatpost different, how is it similar? Please feel free to go into detail. Thank you. Do you have a pic or two of the remote switch? I'm not an adj SP user, and not to rain on Blurry's parade, but a buddy told me yesterday that he saw a new Maverick adj SP that worked like a garage stool. Lever between the legs/under the seat that actuates a gas strut. Sounded cool. TFWIW. What the heck do you rest your chest on during steep drops if you lower your seat, anyway?! No indexed positions. You can't count on being in the same position other than fully up, or fully down. No remote [yet]. You reach between your legs [Ooooooooooo] to activate the post. What do I rest my chest on during steep descents? Nothing. I heve to suspend my bulbous body with my knobby knees. How about a third thing wrong with the speedball - it won't fit a turner... 30.9 and 31.6 sizes only (at least per their website). Last edited by SilverSpot; 03-21-2006 at 08:43 AM. 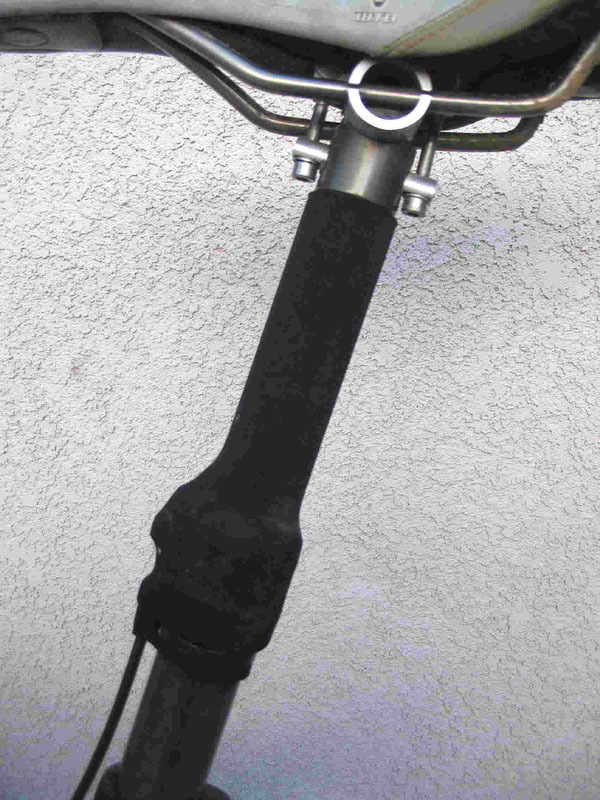 It is similar to GravityDropper in that it offers multiposition “on the fly” adjustment of the seatpost height, however the mechanism that allows this ability is very different. I do not feel comfortable in describing the exact mechanism at this point because we have not yet reached the market. I can tell you that there are no pins used to hold the post in position as GD uses, and hence there are no holes through the post. We feel this will give this post superior strength versus the GD. Like GD it is mechanical, no seals or oil. Lowering and raising the seatpost takes less than a second as well. As for the switch we are currently using an old lockout levers for prototyping. The lever that will come with the post will be CNC’d alloy, offering lever adjustability (similar to the pull lever on the XO triggers). Blurry, you're such a tease! Showing us pics, yet hiding some of the goodies under the neoprene stocking, not divulging your secrets! I might speculate that your detent mechanism is actually underneath the upper, moveable seatpost, in the lower portion of the seatpost, hence, no detent holes in said seatpost. C'mon Blurry, if you want to lure some of us away from our gravity droppers, you need to show and tell us a wee bit more! Tempt the kiddies with some candy! I can tell you the weight of this prototype 30.9 post was 400 grams. The 27.2 will be considerably lighter than that. As far as the cost, we don't have a solid number yet, but it will not be more the the GD. When we get the lever finished I will post pics of it. Your right, the neoprene does do a good job of hiding the goodies, it also works well at protecting the goodies from mud. Any plan for a setback version of the post? I know the gravity dropper doesn't have that option. I'm tall with long femurs, so I really need a setback to get my pedal position right (I tried a straight post and it just didn't work out for me). That's one reason why I haven't purchased a GD and that could be a nice differentiater for your product. Hey Blurry if you wan't to really set yourself apart from your competition, make a 5 inch version for us Huckers. Also, if you expect to succeed with this product, your customer service will have to be on par with Gravity Dropper, and they set the bar pretty high. No offense, but this thread seems pretty premature. You can hardly give us any details at all (and we are kinda geeky when it comes to the techy stuff), few pics, etc. Not sure how it could even be called spam since there is nothing to buy. "New product release... eventally" may be a good hook. The things which bust on the GD posts is the head clamping mechanism. I think it would be a big evolutionary step for someone to put a head like a Thomson on one of these posts. Even though I don't like setback posts at all, some people do. That may be an option which would increase interest (offer a straight and a setback). I'm all for more products of this sort. I like the idea of the neo sleeve. The accordion boot on the GD is really dorky (but works well). An issue I have with the Speedball is that when I carry my bike (through snow, whatever) I lower the GD and then rest the nose of the saddle on my shoulder. This would not work with the Mav post. We are not trying to tease as much as let you know that there is soon to be something to give you an alternative to GD. I think the GD is a great post, but the seat post world has room for another. One thing we are striving to do is make a very reliable and strong post. That is why we are making a 30.9. Some guys might like to run a post sized for their bike and not want to run a shim. We feel our locking system is very slick and opens the door for many position possibilities. You want 1,2,3,4" drops, no problem and no weight limit (Within reason.) We have tested many and find the 1"-3" drop to be perfect for tight technical single track and knarly downhills. We would really like to hear some feed back on some of the things that you (real riders) would like or dislike in your dream post. Like Blurry said, we are looking at a lever that will allow infinite adjustment of lever position and be left or right sided. We feel this is a great idea...what do you guys think. We are also looking at a set back version because I have long legs! I would also like to mention that before the full product roll out we want to have a few test riders from here test them out and give us the honest feedback we need. We don't want our engineering bias getting in the way if things need fix'n. Cool, I don't ride a GD post but was thinking about getting one. I would be happy to test ride one for ya Can't give you any direct comparison to the GD but I could give you feedback. 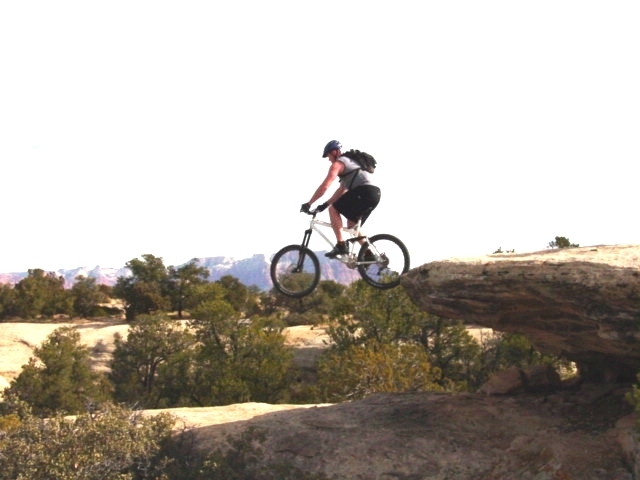 We have some good terrain here in C. Springs and I will be out in Moab/Fruita several times this spring I'm sure. Doubleoh9 is the friend I mention in the original post. You really need to do a 4" or more version. 3" is not enough for a gnarly donhill imo (and the opinion of others). Send a prototype to Team Sanchez in St George (El Chingon et al). It'll get plenty of rough love. Yay, another new crutch for our bicycles. Holy crap...that seat clamp interface setup looks scary. Looks the same as the GD, hasn't that broken on a few of you guy's post? Aqua- you really need one, especially since you stay seated while airborne Gotta watch after those family jewels ya know. Very interesting, and after riding SoMo in Phoenix this past weekend a Gravity Dropper has been on my brain ever since then. Thanks for posting this as now I may hold off for awhile on the GD until we find out more details about your post. I'll echo what a few folks here have said. I've had a gravity dropper since summer of '04. The weakest part of the mechanism is the saddle rail clamping pieces. They [yours!] should be beefier. And if you want to torture test your post in a short period of time, send one to El Chingon. He's the only guy I know who's actually broken a gravity dropper. Thompson has a very good seat clamp. I do miss that going to the GD. Nothing wrong with it AFAIK but I liked the Thompson more. If you're going to send it out for user testing, try to avoid "Left Coasting" it. Sometimes it seems like some mfgrs design and test with only the wide open spaces and hour-long inclines of the West coast deserts in mind. Many people ride trails where you don't see a change of incline until you're right up on it so instant and easy is the only thing that will work ...That said, Team Sanchez will find the product's limits, keep them in mind when speaking of strength and no weight limits. After using the GD with the remote I can say I have no interest in using a post w/o. If you really want to design in a feature of distinction, make it easy for the user to set the drop stop positions. Many people like the -1" + -4" GD. Some would like to experiment with different positions. If you could make one where we can set the stops we want...and get to them w/o blowing by them, you would have something unique. Price is another concern. If it's going to be more expensive than the competition you might chase away some interest. The high-end extras have gone up a lot in the last year. Popular Hubs, headsets , Front and Rear dampers have all spiked way over what many of us would have imagined. Just how many more superpriced componenets will we go for is anyone's guess. Last edited by Bikezilla; 03-21-2006 at 10:40 AM. I PM'd 009 to let him know that we are game to test ride his new product. Hopfully my 230 lbs will not scare them off, as I know several other riders on this board approaching that weight. It is true that I snapped the clamping head of the GD, but Wayne from GD told me that the new ones have been beefed up a bit. El C, perhaps they will name a model of their seatpost after you. The "Team Sanchez" model will offer 5 inches of drop, and it will double as a pry bar for moving those pesky rocks out of the landing zones. I like that idea. I talked to the guys at GD, and they told me that the market for the 5 inch would be relatively small, as you would need to show 8 inches of post to make it work, and there just aren't that many of us out there with 8 inches showing, so to speak. Blurry25 and Double09 - if you would like another tester (who has broken a GD) I would be game. Oddly enough mine broke under almost exclusively agressive XC riding/racing (Xterra) no drops over 1 -2 feet. If it would be of value to you and I am an example of one of your target markets, let me know. I my Thompson showed 8" when I had it in the short drop position. I easily ride with 9 even 10" showing. So does AK Chris, and Blue Shorts. And Blue isn't exactly Wilt Chamberlin. Wait... we are talking about seat posts right? Seriously though, there's plenty of folks with lots of seat post showing but I see your point on how many would really need a 5" max drop. 4" seems sufficient for me thus far. Hey, how about leaving a spot for a workstand clamp? Yea, and a tie-down point for anchoring the neuticles to? ...And don't forget the EBM mount. People used to say that about suspension. Just saying. Yes!!!!! That's my biggest beef with the GD....... not enough room below the pin mechanism to allow for a workstand clamp. huh! i just ordered a decender (the non remote gd) last week.... the 4" drop with the 1" stop from the top. at the price i paid for it im planning on using it for a long time so i guess im wasted on you. Hey guys, thanks for all the great feedback. The reason we came out with this info before the posts were ready to go is to get ideas from the guys that are going to be using them…well, we hope will be using them! I think the way DT posts here, shows pictures of new stuff, and takes feedback is the way the bike industry needs to be. Why not find out what people really like and dislike and use that information to improve the design. DT sets the standard and that is why we chose this board to get the word out. I’ve PM’d with a few of you about getting test units out in the coming months and we are looking forward to seeing what you guys think. All the comments up to this point have been great. We have changed the seat clamping system a little, but it is not a Thomson. However, we don’t think it is going to be too easy to break….although some of the pictures I see here make me wonder how DT can sleep at night! Sorry if this seems premature. One of the main reasons for posting an early thread was to receive feedback from people who actually ride. Both of us ride and have our opinions on what makes a good product. Receiving suggestions and advice from others will help us to refine the seatpost, correcting issues we may have overlooked. Not giving details, sorry there too. 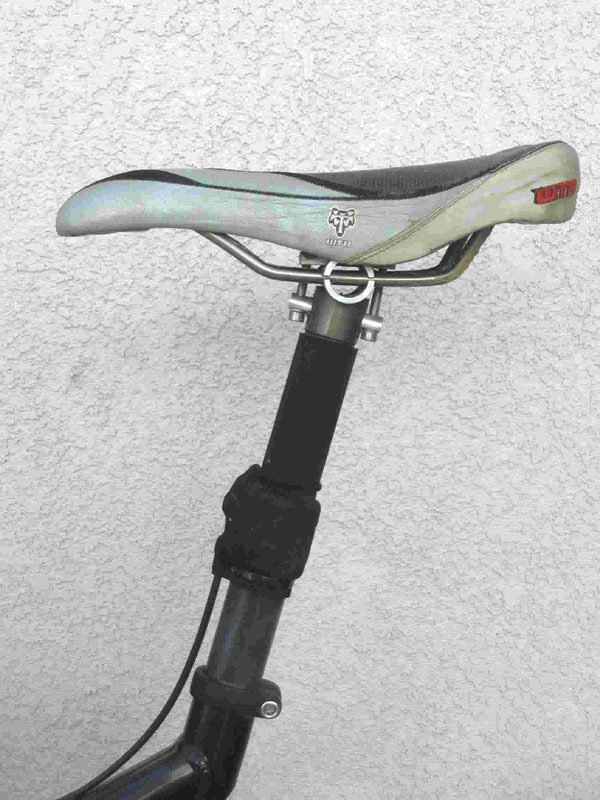 A lot of time and money have been invested in this seatpost design. It would be a shame to get scooped at this point. As for the head clamping mechanism. That clamping mechanism shown in the pictures was the quickiest and easiest way to get the post out on the trail for testing. Changes to the clamping mechanism are already in the works. The new version is much beefier and a whole lot more elegant. although some of the pictures I see here make me wonder how DT can sleep at night! Make a version with a slight offset seatpost clamp. Have you any pics of the seat clamp mod to your GD and advice i really dont like the clamp on my GD its the bigest weak spot IMO...but i love what it does for my riding ..taking away the need to stop and adjust just makes the ride flow that much more satifactory. First Frankenforks, then Frankenbikes, now Frankenposts. I'm going to take a look at this mod when I get in. it's a MAVERICK product. therefore designed for posing, not using. Just use the Thomson parts with the bolts from the GD. Mine fit perfectly. Just adding my two cents. I was poised to to get a Gravity Dropper any time now but I am going to wait to see how your projdct fairs. I just hope that late spring early summer does not turn into Christmas. Just kidding, I know getting a new product to market can take longer than planned for more than 100 reasons. For what it is worth, I am thinking of a 3" drop, although I am going to check and see if 4" would work (assuming I have enough stick out). Probably 0 to full drop with the remote on the left bar operated by my thumb ( I run a 1x9 drivetrain ). Looking forward to it Wayne. Jusk poking for any updates on your progress with production. I am getting itchy for a drop down post and there is a lot of chat about the Gravity Dropper. Okay I am gettting anxious, any updates yet? Next week I am thinking of getting a Gravity Dropper if I do not here any updates from you guys. I could change my mind since I am very interested in your product but I am also very wanting a drop post. I posted a new thread with updates.